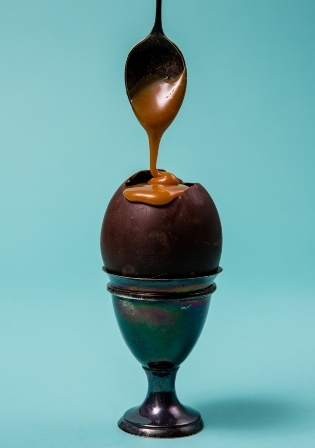 Why not have a go at making your own chocolate eggs this Easter? To make 6 chocolate eggs, you will need at least 300g dark chocolate. Using a greater quantity – for example 600g – will make it easier to dip the balloons. Leftover chocolate won’t be wasted, as it can be stored and re-melted another time. The method below is specifically for tempering dark chocolate. The temperatures for tempering milk and white chocolate are different. For best results choose dark chocolate with a minimum of 70% cocoa solids. Before you start, rig up a string hanging line between 2 kitchen cupboards or hooks. Have clothes pegs handy so that once you have dipped your balloon you can hang it up to set. Melt 2/3 of the dark chocolate in a bowl over a pan of hot water. Make sure the bowl isn’t touching the water. Chop the remaining third into fairly equal pieces and keep to the side. Wash, dry and inflate 6 mini balloons until they are roughly the size of a large egg. You can manipulate their shape with your hands once they are inflated and tied. When the chocolate is melted, remove the bowl from the pan and place it on a tea towel. Add the remaining chocolate pieces and stir to melt. This will bring the temperature of the melted chocolate down, but you will need to continue stirring for at least 15 minutes or so in order to temper the chocolate. To speed this up, you could spread the chocolate out on a clean, dry, metal baking tray or a cool marble surface. 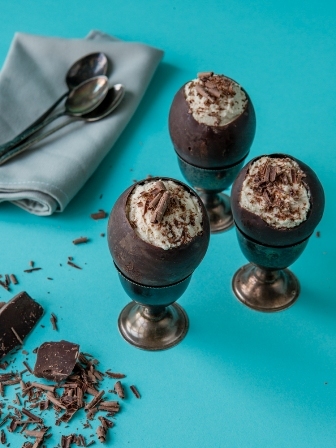 Use a digital thermometer to measure the temperature – you want to firstly cool the melted chocolate to 27℃. Once at 27℃ place the bowl back over the hot water and bring the temperature of the chocolate up to 30 to 31℃. Transfer to a jug or narrower bowl to aid dipping. Dip the first balloon into the jug of melted chocolate and tilt or push down lightly to coat the balloon – leave clearance of about 2cm around the knot of the balloon. Peg the chocolate-covered balloon by its knot onto the string line. Repeat with the other balloons. If needed, use extra clothes pegs to create spacing on the line – you don’t want the chocolate-covered balloons to touch. Leave to set for around 15 minutes. Keep your kitchen cool and free of steam to help the chocolate set. Once set the chocolate should have a smooth shine to it. Unpeg the balloons and use scissors to snip a small hole in the balloon for the air to escape. Loosen the balloon skin from the chocolate shell and remove it. You are left with your chocolate egg-shaped shell. If your shells dry with a mottled, streaky effect the tempering has not worked and the chocolate has ‘bloomed’. You can re-melt this and try again – it is not wasted.